Bronze. Thessalian. Last quarter of the 6th century BCE. Condition: patina a fine sandy green with undertones of reddish brown metal beneath, which shows through where the bronze has been scraped or abraded. Right lower leg broken, re-affixed recently, toes missing as well as front half of left foot. Represented looking back as he runs with one knee almost to the ground in the archaic fashion. A most interesting parallel for the position, though later in date, is the glorious Attic funerary monument of a hoplitodromos1 whose representation harks back to an earlier convention. Our runner is probably participating in a relay race or in a race of some distance2, for on short distances, runners are wont to look forward, as looking back causes a loss of speed and endangers balance. Thus, the present figure cannot be running the stadion or the diaulos3 which were the short races. Though we can find no pertinent comparison, he bears — notwithstanding his considerable humour, provincialism and spirited vigour — a relationship to other figures from Northern Greece, such as the running comast from Corfu4 and the Artemis from Thesprotia5, both believed to be influenced by Laconian art6. To these should be added the Nike from Tarentum in the British Museum7, likewise Laconian influenced, which happens to wear a sort of polos with vertical notches somewhat resembling the rim of the coif on our figure. These examples illustrate the ties between the Peloponnese, Northern Greece and Magna Graecia. Whether our figure was affixed to the rim of a vessel or formed part of an independent group is uncertain, but we feel fairly sure of his Thessalian attribution which is strongly re-inforced by comparison with two bronze statuettes from Pharsalos8 in Thessaly. They have a similar hairstyle over the back of the head and neck, ending in a point, with a slight difference in our statuette in the measure that it flows as he is running. The knees of both comparisons are indicated by a lozenge, as on the right knee of our figure, and the markings for the shoulder blades are similarly indicated on one of the above9. 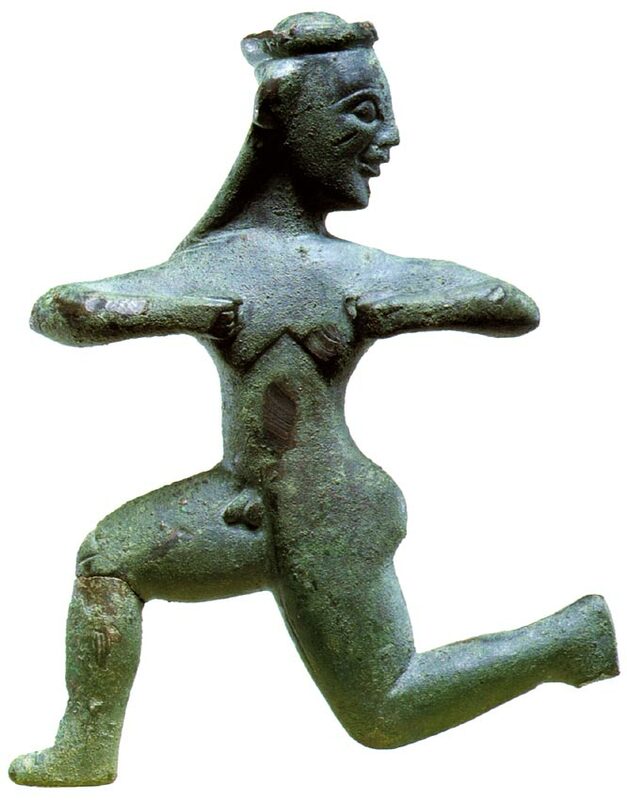 This statuette is ascribed to the last quarter of the 6th century B.C. based on certain features and a general roundness in appearance, this last though in contrast with a certain flatness at the back which might indicate that he adorned a vessel. Also, provincial productions are always to be dated later than those from the great centres. 1 Athens, National Museum 1959: S. Karouzou, National Museum III. Guide (1977), pp. 51-2. 2 For an illustration, see the Panathenaic amphora Louvre F 277, dated ±500 B.C. : C.V.A. Louvre 5 (Fasc. 6) III Hg. Pl. 3 (1, 3, 4, 5). 3 The stadion = 192,27 m in Olympia and 177,55 m in Delphi. The diaulos is a double stadion. 4 Corfu, Archaeological Museum 1602: G. Dontas, BCH 93, 1969, pp. 39—55 pl. I—II. 5 Berlin, Antiken Museum Misc. 7971: K. A. Neugebauer, Staatliche Museen zu Berlin. Die minoischen und archaisch griechischen Bronzen (1931), no. 214 pp. 107—9, pl. 39. 6 The comast from Corfu: G. Dontas, loc. cit; M. Herfort-Koch Archaische Bronzeplastik Lakoniens, Boreas Beih. 4, 1986. K 108 pp. 110—111, pl. 15, 1. The Artemis from Thesprotia: K. A. Neugebauer, loc. cit. 7 British Museum 495: U. Jantzen, Bronzewerkstätten in Grossgriechenland und Sizilien (1937), p. 26 no. 4. pl. 12, 46. 8 Zeus with lituus, Volos Museum 652 & Warrior from Simikli, Athens National Museum 15182: H. Biesantz, Die Thessalischen Grabreliefs (1965), p. 33, nos. 88 & 89, pl. 58-9. Exhibited and Published: Le Sport dans la Grèce Antique. Du Jeu à la Compétition, Palais des Beaux-Arts, Brussels, 23 January — 19 April 1992 (catalogues in French and Flemísh); El Deporte en la Grecia Antigua. La génesis del olimpismo, Centre Cultural of the Fundació “la Caixa”, Barcelona, 13 May — 9 August 1992 (catalogues in Spanish and Catalan); cat. no. 179, pp. 313—14. © 1993. Photo, text: Olympism in antiquity. Olympic Museum Lausanne. Bertelsmann UFA. Industria Gráfica S. A. Barcelona, 1993, p. 107 cat. no. 50.